I couldn’t resist a HuffPo clickbaity title. Forgive me. This story was on many right-wing websites yesterday, but I refrained from posting about it (though I shouldn’t have to given the copious documentation). Now, however, the New York Times has picked the story up, and also reported a fillip: House Speaker Nancy Pelosi has spanked Ilhan Omar for Omar’s antisemitism. I believe, but don’t know for sure, that Omar—and perhaps her colleague Rashida Tlaib—are not just Muslims but Islamists, dedicated to spreading their faith more widely. Regardless, see this NYT article for more criticisms, but also for the claim (on February 1) that Democratic leaders were still standing by Omar as well as Tlaib, who not only favors BDS but the genocidal “one state solution”. All this became too much for the Democratic leadership, and, one by one, Democrats have been calling out Omar for her hateful views. Today five house Democratic leaders issued the statement below, tweeted by Pelosi after she had a “conversation” with Omar. I can only imagine how that trip to the woodshed went, but the statement below stands by itself as an explicit indictment of Omar’s anti-semitism.
. . . what distinguished the events of Sunday and Monday from earlier controversies around Ms. Omar was the willingness of Democrats to join in. Let us be clear here: Omar was never contrite. Nor are Tlaib or Ocasio-Cortez. They’ll simply keep a low profile for now, as their power in their own party (and their re-electability) will be compromised if they continue going after the Jews. Yet these young progressives are simply sharing the sentiments of their progressive peers that Israel is a monster compared with Palestine, that BDS is a good way to go after Israel, and that we really need that one-state solution, which of course will eliminate Israel after a lot of killing. This is what you get when you ignore the bigotry of the Democratic Socialists. It’s ironic, but completely understandable, that “congresswomen of color”, who should be dedicated to inclusivity, have decided to exclude the one group that has been scapegoated for millennia: the Jews. Yes, Omar et al. are going to mute themselves (if they’re able to! ), but they will not change where they stand. People have been urging these three Congresswomen to restrain themselves on other fronts, saying that they need to cut back a bit on their unrealistic desire to transform America instantly. Well, I share many of their goals, including higher taxes on the wealthy, an increase in capital gains taxes, universal medical care, and a serious effort to cut the usage of fossil fuels and stem global warming. Yes, they need to proceed a bit slowly there, as that transformation is not going to happen overnight. But what they can do now is to stop dissing the Jews. 2.) Omar didn’t apologize but says she is “listening and learning”. What that means, I suspect is that she’s learning how to be antisemitic in a more subtle way. 3.) But note as well the lists of lobbyists who are “problematic”, lumping AIPAC with the NRA. Fine, but where are CAIR and the other Muslim lobbying groups? Are they not “problematic” too? This entry was written by whyevolutionistrue and posted on February 11, 2019 at 2:00 pm and filed under anti-semitism, politics. Bookmark the permalink. Follow any comments here with the RSS feed for this post. Both comments and trackbacks are currently closed. You’d think that “as an American” would be the perfect phrasing for someone who is American to refer to an interest of national politics. This trend of criticising phrasing as being secret racism / sexism / homophobia / transphobia / etc. is one of the most intellectually dishonest and vapid uses of social media. Not only is it trying to make something out of nothing, it’s utterly irrelevant to the topic at hand. If what Clinton said is racist, then the word literally has no meaning any more. Exactly, I cannot make any sense of Ms Anoa. Is she American? If not, does she think all ‘Americans’ are white? Or what? Well, yes, the USA has a long history -and an ongoing one- of racism, but I do not see how identifying as ‘an American’ can therefore be construed as racism, particularly in a tweet that is in essence an affirmation of anti-racism. Like many, I had never heard of Changa. A quick google showed me that she is not someone who I would bother to respond to if I was Clinton. To me it says that Anoa is the one with the problem – she sees a refugee who has become a USian as somehow less than one who was born there. She’s projecting her own prejudices onto Clinton imo. I don’t know if she’s projecting victim-hood but remember that it is advantageous to the “woke” to be as far down the oppression ladder as they can be, and so she’s doing Omar a favor. I interpret her words in another way: that because Ms. Omar is a refugee, she can think and do no wrong. That’s definitely another very strong possibility! Well, in the current climate it makes perfect sense for someone to be branded as a racist for simply stating that they are American. There was recently some leftist protest or counterprotest, a young man came to attend it with a US flag, the others considered him a Nazi for that reason and beat him up. Unfortunately, I have forgotten the details and would have to dig long to produce a link. How is C.Clinton flaunting her Americanness? Is this even a word? How is she racist? Someone please explain, as a Brit Canadian I don’t understand the tweet. I do however clearly understand the horrible Muslim congresswoman. As a Dutchie, I have the same question. Also I do not understand doubling down here. Somehow Changas tweets are even more irksome than Omars. I agree. Changa is a pretty blatant racist. anti-Semitic. 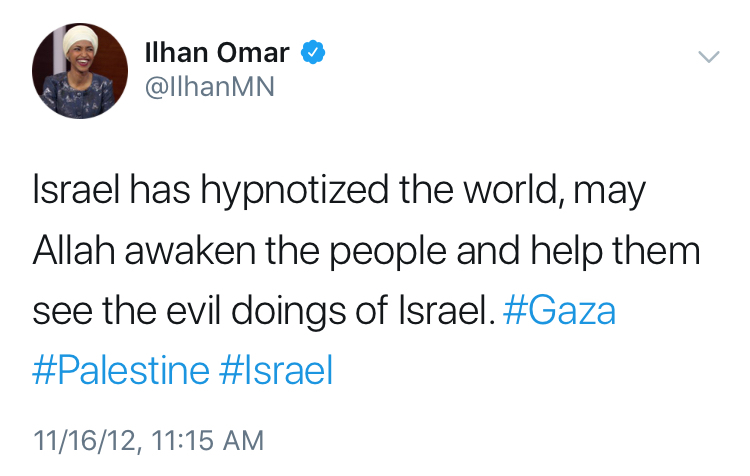 What bothers me is that all her clearly anti-Semitic statements up till now have gone unnoticed, and only when she mentions AIPAC does she get in hot water. She didn’t just mention AIPAC, she said the only reason Republicans support Israel is because AIPAC is paying them to do so. All citizens of the Americas are racists. Chelsea Clinton is an American. You aren’t missing anything. What Changa is missing is any kind of logical thinking. Sad. That was a perfectly valid argument. Its soundness, however, leaves much to be desired. I guess Anoa was angling for deference to a refugee. To her that seemed to be Very Important and so we should just ignore Omars’ missteps. No, it does not make sense to me either. You can read it as suggesting that Omar is not an “American”. Imagine in a different context, like a Texas conservative criticizing a Latino “As an American”. 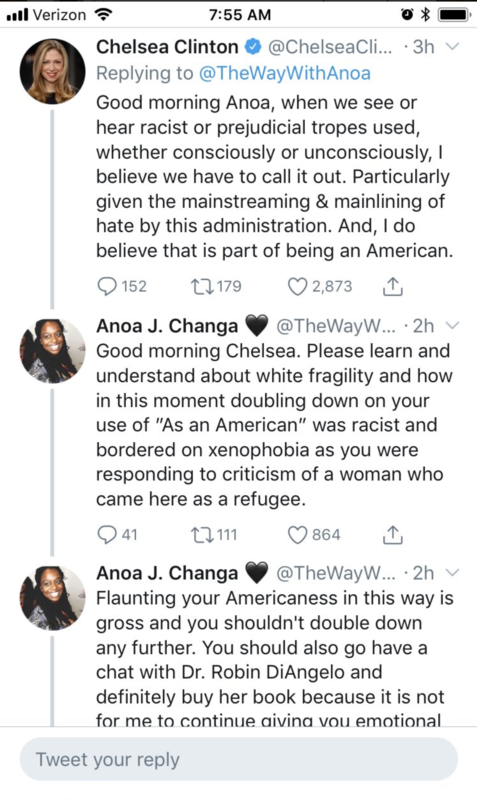 I think it’s pretty clear what Clinton was saying, and it wasn’t that, but Changa sees Omar as part of her in-group, and not Clinton so she’s disposed to reading things in the worst way (so she can get angry at Clinton rather than grappling with what she said). Omar’s tweet was pathetic as were Changa’s tweets to Clinton. OK, I’m struggling to see how “as an American” is racist. And on a related topic, did AOC really promise “economic security for those unwilling to work”? That’s not going to go down well with middle America. Are they actually *trying* to lose the next election? Yes she did. It’s in the first draft of the Green New Deal document and, I believe, is still on her website. “…unable or unwilling to work” well yes, if you’d scrap the ‘unwilling’ it would be a great document. Yes, I know it is a cheap quip and I’m not serious there. About “unable” – isn’t it covered now by the Americans with Disabilities Act? I wish Democrats would stop writing Republican campaign commercials. The right wing press calls her Alexandria Occasional-Cortex. Kinda funny. I admit that I have laughed at this and repeated it, though in principle I am against mocking people over their names. Well, many people need to rest sometimes from their principles :-). Coel – your last comment relates to my thoughts. This trio and their ilk seem clueless that the are contributing to Trump’s re-election. Such talk fires up the Orange Draft Dodger’s base, alienates reasonable democrats and independents, and provides fodder for the Orange-utang and his hit men. Even if Roger Stone is in jail, he will unleash a firestorm based on one of his “Stone Rules”: hate is a far greater motivator than love. Nobody really thinks it is racist to say that. Calling someone racist is just a way to shut them up. They have to switch into a defensive mode, instead of pursuing the original discussion. Omar has “unequivocally apologized” for using anti-semitic tropes. Now let’s see how long before the next. The thing is that her apology (I wouldn’t call it a clear ‘nonpology’) was not really unequivocal, as pointed out by our host. If she had left out the second paragraph about AIPAC, NRA and fossil fuel industry it would have been, or even if she had only included CAIR, I’d have given her the benefit of the doubt. But she didn’t. Although she’s still young and might indeed change, I think you’re right we’ll see a next one in the not so far future…. Welcome, USians, from across the pond to the swill of crypto-Islamists cess-pitting your parties of progress. Prepare yourselves for the following excuses: MSM, out of context, smear, red Tory,…and he’s Jewish, the most right-wing government for decades, diversity by appearance and faith, free speech, breath of fresh air. And on and on. Remember Naz Shah the anti-Semitic Labour M.P. of Muslim background whose blurtings flushed out Ken Livingstone’s deranged personification of Godwin’s law? Ken was unlucky: had he been leader of the Labour Party, he wouldn’t have been chucked out. Naz survived after wibbling on in the requisite way about learning moments, offence, sorry if… and alleging that she had recently met a few Jews. The thing is that the British Secondary History curriculum rattles on ad nauseam about the Nazis. Was she absent for all those lessons? Did she not listen to the debate set up by her kindly History teacher – “The Holocaust: pros and cons”? Or was her moral compass set to its fifth point? How can you not know that the normal person’s response to anti-Semitism is to think, “Dowun wid dis koind o’ ting”? I assume the U.S. History curriculum does a similar job. Ilhan Omar must be desperately seeking a convenient Jew to patronize. Look no further than Alexandria Occasionally-Cohen. Omar has “unequivocally apologized” for using anti-semitic tropes. But not because they’re anti-semitic, because they hurt people’s feelings. She has to tread carefully. She needs to avoid overt offense, while keeping the approval of those who elected her, largely a group who hate Jews. Co-signing is anti-Semitic. It’s gross to think that someone doesn’t know how to sign their own name. 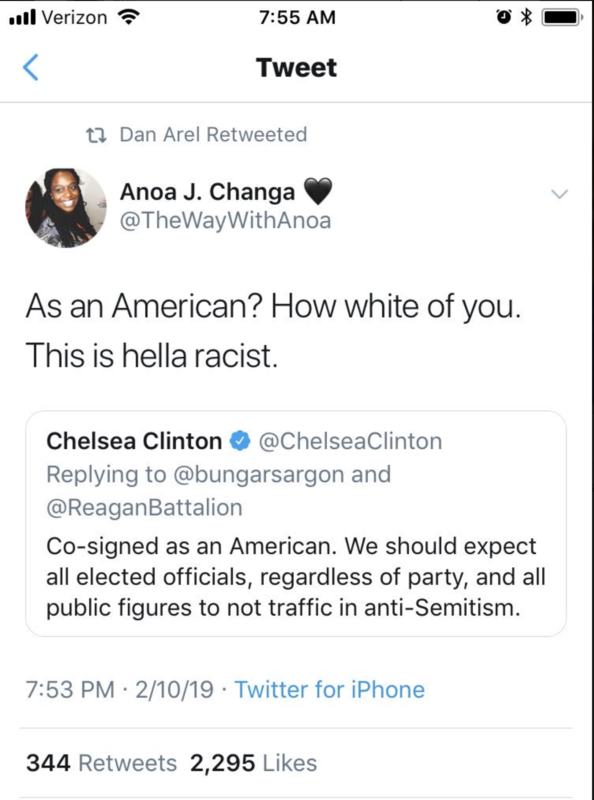 Check your “write privilege” Chelsea. Wanting to spread Islam does not make one an Islamist. Wanting to have Islam privileged and imposed by the government does. And sincerely, is there any way to criticize Zionism, the Israeli government, or pro-Israel lobbyists without inviting an accusation of anti-Semitism? As far as I know, this is simply not the standard applied to any other nationalist movement, government, or lobbying cause on the planet. Can a Jew criticize those (many do, and Greenwald is one of them) and not be labeled anti-Semitic? How exactly does all of this work, if not merely guilt by association? You can criticize Israeli government, Israeli policies and pro-Israeli lobbying to your heart’s content as long as you are checking the facts and not repeating lies, smears and slander nor generalizations in the style “allpowerfull Israeli/Jewish lobby”. Nobody would call you antisemite for that. With Zionism it’s a different story. Zionism is a very special type of nationalism. It’s saying that after 2000 years in exile, with all persecution that went with being a minority everywhere Jews lived, they now returned to the country in which their nation, language culture and religione were born and they are entitled to live there as a majority which is self governed. If you deny the Jews this right to independent state where they finally do not have to be left on the mercy of the majority population and can defend themselves, you can (and will) be called an antisemite. Because no matter how awful are governments in many other states nobody denies them the right to exist and to defend themselves. Exactly, you formulated it much better than I could -and was planning- to do. Yes, Malgorzata’s explanation is succinct and exceedingly well-put. I’m going to print it out so that I’ll remember it. She has made other germane comments discussing Israel and Zionism in previous posts. It’d be good to gather them together. I have been wondering a similar thing. How can one try to advocate for openness and acceptance of Islam without some others thinking that you are trying to recruit others into the faith? I am sure that is a problem that public figures belonging to any minority religion faces. Well, you don’t tout the virtues of sharia law, as Linda Sarsour did. You don’t mix your advocacy of openness with calls for the extirpation of Israel. Is that so hard? I mean no confrontation. I find your comment very interesting. I have a couple of honest questions (forgive me if they stem from ignorance): Is it possible to accept and understand the existence of the State of Israel given the tragic history that preceded it while at the same time being intellectually opposed in principle, as a liberal, to a nation being defined in ethnic-racial-religious terms (where a specific “majority” is to be preserved)? And what happens if a particular group was born in place A, but centuries (or millennia) later they are no longer the majority in this place A: Do they have a right to “return” irrespective of the rights or opinions of the current inhabitants of said place? Again, I am not trying to be antagonistic, maybe a bit like a devil’s advocate. To clarify, I have zero support for the Palestinian Authority and do think that Israel is a beacon amidst a really fucked up bunch of territories. I’m probably not the right person to answer your questions. I’m very ”down to earth” woman, pragmatically dealing with realities, not with hypothetical situations and abstract principles. If something is damaging to living, breathing people, I don’t even understand how an abstract principle can play any role or be taken into account. An abstract notion of a nation not being defind in this or that way when people are killed (like Yazidis were – an ethnic-racial-religious group) is in no way relevant when this group has to be saved – and if the only solution to stop killing is a nation defined in ethnic-racial-religious terms – I’m all for it, no matter how much I would like the idea of a general “brotherhood of all people”. And the question about a group that after millenia is no longer in majority – this is too hypothetical for me. The reality is that Jews are the only indigenous people in history who did just that: returned after millenia to the land of their ancestors and resurrected their state. This was possible because of exceptional historical circumstances, the main of which was that during those two millenia of their exile there was never an independent state of any other nation on the territory they called theirs. It was always a provincial part of one or other empire. There was never a coherent nation living there since Romans exiled Jews. The ”Palestinian people” were created in 1950s and 1960s. with explicit aim to fight with Jews. Native-Americans in U.S, and Canada are in a totally different situation; they have to deal with well developed, organized states and cannot repeat what Jews have done. Of course, they can fight for at least equal rights but that’s a different matter. And, by the way, Israel, the Jewish state, is giving equal rights to its non-Jewish citizens who are a substantial, 20% minority. Thank you for your reply. As I said, I am not trolling at all and in fact I support the right of Israel to exist. I started to write a longer message but realized that I am not qualified to engage in a discussion that would derail the purpose of this site. In the end, I think I can agree with most of what you say and don’t want to sound pedantic or too abstract focusing on academic details. The creation of the state of Israel is a done deal. To advocate for its dissolution now is to advocate for the genocide of the Jews who live there. But if you are going to say that, in a discussion about the historical act of creating the modern state of Israel you cannot be critical of that decision without being anti-semitic, I can’t support you. Many new countries were created after the collapse of the huge empires in the wake of WWI. Then more were created after WWII and during 1950s and 1960. Nobody is critical of the decision to create any of these states: not Pakistan, not Somalia, not Syria, not Jordan and so on. Only about the creation of a Jewish state one hears opinion that it was ”historical mistake”. And a reluctant: ”Now it’s a done deal. It would be genocide”. There are many states (and individual people all over the world) who would have nothing against another genocide of Jews. Stating today that the creation of Israel – and only Israel of all the new states created in the same time or later – was a mistake is for me antisemitic in two ways: one, singling out the Jewish state for something you do not condemn any other state in the world, and two, giving support to people who, while denying Shoah, would gladly arrange another one. Are they not? I’ve heard criticism of the way all of those states were created usually framed as the criticism of the way the imperialist nations of Western Europe carved up the Middle East. The partition of the subcontinent into India and Pakistan was pretty disastrous fr a lot of the inhabitants. People who lived on the wrong side of the border (Hindus in Pakistan and Muslims in India) were often subjected to religiously motivated violence from the majority and the two countries have been at each other’s throats more or less ever since. Whether partition was worse than the alternative, we’ll never know, but people who suggest t was a mistake to create a separate country for the Muslims do not usually get accused of Islamophobia just for saying that. Stating today that the creation of Israel – and only Israel of all the new states created in the same time or later – was a mistake is for me antisemitic in two ways: one, singling out the Jewish state for something you do not condemn any other state in the world, and two, giving support to people who, while denying Shoah, would gladly arrange another one. I refute your assertion that people only criticise the creation of Israel. Being critical of the creation of the state of Israel is not the same as giving support to Holocaust deniers or wanting the genocide of the Jews. Have you seen the balance of the UN resolutions against Israel versus ALL OTHER COUNTRIES? Sorry, but you haven’t refuted anything; you’ve TRIED to refute something. By “people” I am talking about individuals, not countries and the assertion was that nobody is critical of the creation of the the other states listed. I don’t need a majority to refute that statement. I am not here disputing the right of Israel to exist and I am not claiming that the opposition to it is anything but unfair, probably based on distorted reporting of the situation in the media (as documented frequently by yourself). I’m also not claiming that it was a mistake to create Israel. All I am arguing is that there are arguments that it was a mistake that are not antisemitic. We probably read totally different sources. While I read many horrifying descriptions of the partition of India I’ve never seen a sentence (written or said in a discussion): “It was a mistake to create Pakistan”. The discussion about Syria, Sykes-Picot and the mistakes of colonial powers when creating this country started first with the horrific civil war in this country and its disintegration. I’ve never seen any criticism about the creation of Jordan. Could you, please, direct me to such statements? That creation of Syria was a mistake? Of Pakistan? Of Lebanon? Of Jordan? Jeremy, Yes and No. There were and are many opposed to the partition of India, into Pakistan and India. It is estimated the partition killed up to 2 million people, in a relatively short time at that, so it can be considered a genocide. And more than 14 million were ‘displaced’. It was a prototypical example of ethnic (or in case religious) cleansing. The creation of Israel does not even come close. And there is no doubt that Israel is unfairly singled out, time and again. I think the cause is more than ‘just’ antisemitism. 1 -In Islam a non-Islamic enemy in Islamic lands is not to be tolerated. No peace longer than 10 years (IIRC). With 2- the enormous wealth accrued through the sale of petrol, the fundamentalist Wahabbist regimes could spread their reactionary faith among Muslim communities around the world. Combine that with 3 – the mass migration of Muslims to many of the former colonial powers (say the West) where they were indeed kinda underdogs, but vociferously claimed the benefits of democracy and social democracy as due to them. And 4 – the response of tolerance by the by then very democratized ‘Western’ population, who saw the underdog that needed protection indeed, and ‘multiculturalism’ was born. And that 5- allowed Islam to demonise Israel (going back to 1), and to infiltrate and indoctrinate the leftist ‘West’. After all the ‘Protocols’, the capitalist Jews, are grist to the leftist mill. Maybe I’m too concise (and there is much more), but I fear I’m already at the limits of “da Roolz” by writing such a long post. But I hope you get the grist of what I’m pointing at. I’m not so sure wanting to spread Islam is not Islamist. At any rate, wanting to spread Islam and having Islam privileged always go hand in hand in practice. The difference is one of numbers: quietly and modestly spreading Islam happens when there is a small minority, when the minority goes to, say, 5% privileged status is demanded, and when it closes in on 50%, imposition is the default position. And Greenwald is a despicable demagogue. For the rest read Malgorzata’s response. Wanting to spread Islam does not make one an Islamist. In any case, since Islam has as its mission statement the establishment of a global theocracy — by force if necessary — the desire to spread Islam can be seen as less than benevolent by those of us who wish to stay secular and free. And sincerely, is there any way to criticize Zionism, the Israeli government, or pro-Israel lobbyists without inviting an accusation of anti-Semitism? I’m unaware of criticism of any other nation’s government or policies where the eradication of that nation is included. And yet anti-Israeli/pro-Palistinian activism increasingly advocates the dissolution of Israel. Yes, one can critisise the Israeli government and pro Israel lobbyists without an accusation of anti-semitism. Criticism of Zionism is different, because it implies that Israel has no right to exist, a call to genocide in other words. So no, criticizing Israel’s policies is not anti-semitic, opposing zionism basically is (as our host and poster Malgorzata have elaborately pointed out). I just don’t see how the original tweet is so bad. I have no doubt that she is a loathsome anti-Semetic nitwit, proven by lots of other statements but I’m confused as to how THIS statement is evidence of it. I see here a problem because it implies a default position: that no one normal, sensible, educated person would support Israel (and Jews) unless bribed. Antisemitism is trying relentlessly to become the mainstream view. Don’t you see how every single discussion on this subject here is deflected into the need to explain why wishing the destruction of Israel is a bad thing? “Don’t you see how every single discussion on this subject here is deflected into the need to explain why wishing the destruction of Israel is a bad thing?” Perhaps, but that is because we’re discussing some people with some odious views. As I said before, the tweet itself is being pointed to as some horrible anti-Semitic thing. If it isn’t true that politicians can be bought, then why are we discussing Citizens United as if it were the downfall of democracy? Why do people say that so and so is in the pocket of the NRA, of Planned Parenthood, of the oil and gas lobby, Big Pharma, and so on? But replace any one of those with AIPAC and you’re a bigot. (Although it has been pointed out that AIPAC supports causes and not candidates, in regards to the tweet itself I think that is inconsequential to the issue). In truth, I don’t think politicians are bought as much as we like to think. I highly doubt that on many of the big issues that they come to the table with a blank slate and just decide that they will take a lifelong commitment on an issue depending on who dumps the most money in their pocket. They are leaning that way to begin with. And the money keeps them pushed that way. It’s a symbiotic relationship but one the host gladly enters into. That’s the difference between Democrats and Republicans today: Democrats will call out and discipline their own for this stuff. Republicans sat on their hands for 16 years of racist, anti-Semitic, anti-immigrant white-supremacist nonsense from incumbent Iowa congressman Steve King before finally slapping his wrist just last month. Hell, Donald Trump, our twitterer-in-chief, still has yet to say a disparaging word in criticism of his mutual-admiration-society soulmate Steve King. Yeah, but at least King was removed from his committee assignments for his “What’s wrong with white supremacy?” comment. We’ll see if Omar loses her assignment on the House Foreign Affairs Committee. I bet not. I think this is a very good point, and would need to be brought up early and often while the ‘vast right-wing conspiracy’ gears up to use Omar et al. over the next two years. I think the problem is not that the right-wing conspiracy will call out Omar et al.’s antisemitism, the problem is that one of the two major parties in the USA is threatened to be taken over by antisemites, like in the UK. Maybe we shouldn’t suddenly import our electorate from Somalia? I was hoping that Anoa J. Changa was a Titania McGrath-style parody Twitter account. Sadly, it appears not. The real problem is the idea that Jews have bought the government is so entrenched in some political circles that it never occurs to Omar that she is doing something wrong. This just how everyone around her talks. Omar does not understand she is being bigoted. She think she is stating facts. Dan “The Zionists” Arel has come out defending Ilhan. But then again, Dan Arel is a racist piece of s**t.
I think that Trump is the least problem here. He will go. It may be more difficult to neutralize the antisemitic Congress members and their base. Yes, sooner or later he will go, but my worry is the amount of damage he and his cronies will do before their ultimate demise. CAIR needs to start doing workshops for incoming stealth Islamist members of Congress on how to conceal their anti-Semitism and not blow their cover. Changa thinks she found the Holy Word in the writings of Robin DiAngelo. The Gospel according to Robin D.
parroting of someone else’s ideas. Someone must save Angry Catman from the villainous HuffPo’s linguistic corruptor! I read Ms Changa’s twitter feed and almost replied there, but thought better of it. She’s in the bull’s eye for the crazy woke left, using all the key words you’d expect and calling for people to “Stand with Ilhan,” claiming all attacks on Ilhan are from right wingers. Apparently that includes right wingers like Nancy Pelosi? Good that the Democrats are trying to bring Ms. Omar to sense. But I have little hope. When Omar, Tlaib and Ocasio-Cortez were elected, there were ecstatic comments that these women are the future of the Democratic party and of America. I fear that they may come true. I’m petty sure they will not be the future of the Dems. They may actually help by serving as a left wing test case so the rest of the party can figure out what’s salable to the American people. They will likely also stimulate others to propose there own version of left wing legislative proposals. See the Green Deal.